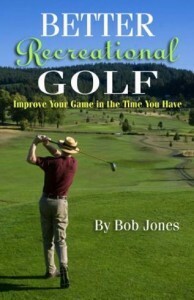 Golf instruction books, videos, blogs, all give you advice on how to swing the club that makes sense to the person who wrote it but is no more than a vain attempt to describe what the swing feels like. That’s what technical advice really comes down to. Those sensations, being subjective, defy objective description. Technical advice can point a golfer in the right direction and warn her or him of things NOT to do, but after that, all is left to the internal investigations of the individual. 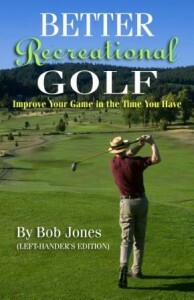 I’m going to make an attempt here at describing the swing in terms of everyday motions, not golf motions. This description lacks detail on purpose. If you can do these things, I believe you will be CLOSER to doing it right than if you followed a mechanical laundry list of what is happening. The backswing: Imagine there is a shelf behind you and just above your right shoulder (left shoulder if you play left-handed). Stand up straight and reach behind yourself with the hand on the opposite side of your body to take something off the shelf. The catch is that your feet have to stay in the same place and cannot turn. Unless you are Gumby, you will will not be able to reach the object on the shelf unless you turn your body. Your legs turn, your hips turn, and your shoulders turn in order to get your hand back there. Now get into your golf stance and do the same thing. Reach for the shelf and you will find your body making a proper turn back. If you do this with a club in your hands, once you are finished you will be in a very good backswing position. Without a club in your hands, you might have turned your head to look at the imaginary shelf, but holding a club, your head stays looking forward. That should be the only difference. As for the forward swing, imagine you are holding an object up there weighing several pounds that you want to toss a long way away from you, and which you are holding with both hands. You would start by getting your hip into it (you would), then your arms would swing forward, and lastly your hands would release the object you’re throwing. The momentum of the throw would continue your body turn, and swing your arms and now-empty hands high and in front of you, coming to a balanced stop. That’s it, the golf swing in a nutshell: reach back for the shelf, throw the heavy object. Now do two things with what I have just said. First, interpret it literally, not literalistically. What’s the difference? If I say it’s raining cats and dogs, the literal interpretation is that it’s raining very hard. The literalistic interpretation is that boxers and tabbies are falling out of the sky. Second, if this description of the golf swing doesn’t make sense to you, or doesn’t seem quite right, or if you have a better way of saying it, don’t quibble. Make up your own nutshell. 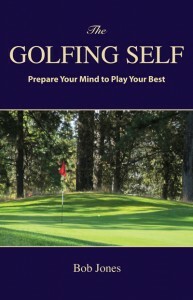 Use what I said as a springboard for finding your own way to express the golf swing IN THE SIMPLEST TERMS. When you’re out there playing is not the time to be thinking of minute technical points. They all have to be included in a larger, simpler conception. I’ve given you two: one for the backswing and one for the forward swing. I’ll let you know when I figure out a way to describe the whole thing at once.